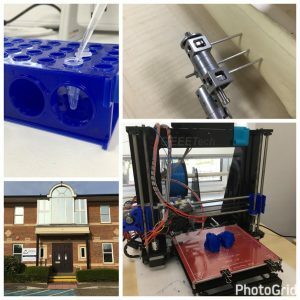 Based at the University’s Medway campus, the Stem Cell Research and Advanced Bio-Engineering Laboratory (SCRABEL) is part of the Institute of Medical Sciences providing teaching and research in a wide range of areas including regenerative medicine, surgical techniques and 3D printing. While SCRABEL is primarily designed to be an evolving facility for advanced regenerative medicine and developing new techniques in tissue engineering and reconstruction, our pluripotent facility allows diverse specialisms to converge and give rise to new insights and innovations. The work taking place in SCRABEL is not restricted to cell culture and characterisation, our work encompasses engineering, 3D printing and design, computing, and development of real surgical techniques spearheaded by internationally renowned surgeons. We feel our interdisciplinary approach enables our facility to support other fields in an adaptive way and facilitate collaboration between different subject areas to enhance expertise. Students are able to learn the techniques already used in SCRABEL, but further are encouraged to develop their own ideas and insights using equipment and technology which is becoming ever more prevalent (for example, our 3D printer – or if you don’t like our one, we’ve had students come in and make one themselves! ), providing teaching which is as interesting, up-to-date and useful as possible. To learn more about the people who make up the team, please click here.